On camping trips, a log or tree stump can often become the go-to seat, but nothing gives you the much-needed support and comfort after a day of activities quite like a camping chair. With many camping chairs on the market – and lots of different styles and prices – finding the right one can feel like a bit of a mission. And if you have ever sat on a saggy and uncomfortable chair, you’ll understand the importance of choosing wisely. 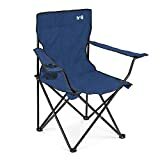 A good camping chair should not only offer comfort, it should also be durable. It will take a lot of abuse from being tossed in the back of cars, dragged around and left out in harsh weather. To ensure that you purchase the right one, you need to consider a wide range of features and uses. Where you plan to go and your primary use for the chair should determine the most suitable option for you. You may want a more comfortable chair that you can use for camping, relaxing on the beach or watching the kids footy from the sidelines. If you are going with your family or in a group, you may like portable sideline benches that can take four to six persons; or 2-in-1 chairs. In summer, you may want a chair which has a mesh back for increased airflow or a canopy chair to shield you from the sun. You may also prefer legless chairs if you are on a grassy terrain. Most foldable chairs are light until you backpack with them for a long time, at which point their weight and size begins to matter. Since you’ll likely be carrying a lot of gear, it is good to have a chair that can be easily folded into a storage bag. Some chairs don’t have this but most of these ones are carried using carrying straps. If you want the most portable chair, go for one with corded legs that you can collapse into a very compact space. 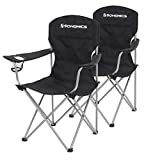 Stools are also another option when backpacking, with tripod stools being the cheapest and lightest but you wouldn’t expect as much comfort as a standard chair. The most comfortable chairs that come with a footrest, reclining capability, plush seats and more can be up to 150 kg in weight. 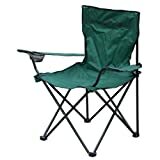 Many camping chairs do not have good back support or any at all. If you have back issues or you’ll be sitting in them for a long time, you will need to consider your choice carefully. 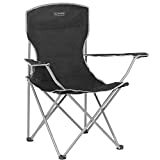 All camping chairs have a weight limit, and some also have a height limit. On average, children’s chairs hold up to 100 kg child and adult chairs can take up to 230 kg. Some chairs can carry the weight but do not have extra room (width), so you need to also check this out because it will make the difference between cramped and comfort. The seats of camping chairs are commonly made from oxford canvas – nylon or polyester – and foam. Oxford canvas is common in the seats of high-quality chairs. They easily resist stain and are easy to clean. They are also waterproof and more durable than foam/fabric covered seats. Closed cell foam padding/fabric covered chairs, on the other hand, are better at resisting temperature change but they are not waterproof. The material of the frames is also important. Metal is quite common. These chairs will withstand the rigors of frequent use and resist scratches. Plastic is used by some manufacturers on the seats or legs; these chairs are lightweight and easier to clean but are not durable. Depending on how you plan to use your chair, there are bonus features that make your experience better. Some things that we would look out for are accessory pockets, insulated beverage pockets, cup holders, footrest, and reclining ability. Now that you know what to look out for, let’s take a look at some of the best camping chairs on the market right now. Overview: A lightweight rustproof chair that doesn’t sink into sand or mud. Weighing just 1 kg, the WildHorn Outfitters terralite chair is perfect for backpacking. This chair is quite sturdy and can carry up to 159 kg weight. The best part of the chair is its two interchangeable standard and Terragrip feet. With the enhanced feet, you can sit on a sandy or muddy terrain without sinking. The legs are further joined together with a shock cord for enhanced stability. The WildHorn chair is very durable, made from heavy-duty aircraft grade 7075 aluminium alloy making it completely rust and corrosion proof. In addition, the seat cover is removable and is machine washable. There’s also a mesh fabric at the back of the chair for air flow. The only downside to this is that it is not cushioned for comfort. Another good thing about this chair is storage. The poles slot apart easily and can be folded into the storage bag. The storage bag is made of mesh fabric and has Velcro carry scraps. This bag can be attached underneath the chair when not in use or used as a handy storage pouch for your torch, keys, and cell phone. The downsides to this chair is that it is not so high off the floor and it is tight fit for most people over 90 kg despite the 150 kg weight limit. 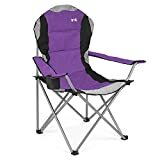 The AmazonBasics camping chair is simple in design and multi-functional. There are two versions – the padded nylon fabric which offers cushioned comfort or the mesh nylon fabric that gives you enhanced ventilation with a measure of comfort. It has a large and an XL version that can take up to 102 kg and the width of an average person. The back support is also quite tall, however, the legs are narrow; few users complained that their legs almost got bruised as a result. Nevertheless, the frames are heavy-duty steel and are collapsible. When folded, they can easily fit inside most car trunks. For easy storage, there’s also the carry bag that can be slung over your shoulder. Another good part of this camping chair is the cooler. There is insulated pouch on one side of the armrest that can carry up to four 354ml cans. One gripe to the storage though is that it is hard to fold back after use thus, making storage difficult. There’s also an integrated cup holder on the other side of the chair and an accessory pocket that hangs from the side of the chair. With this, you can store your sunscreen, sunglasses, cell phones, and other items while you relax. The Coleman Deck Chair is a perfect blend of form and function. While this is not an XL seat, it can carry a weight of up to 113 kg and width of up to 52 cm. Its fabric – 600D polyester oxford – is waterproof and abrasion-resistant. It also features heavy-duty aluminium steel frames that ensure strength and durability. With it’s padded solid armrests and a cushioned back, you have comfort for hours. The armrest is also removable and washable. There is also a side table with a cup holder that’s convenient for having your meals or placing your book and phone. One downside to this chair though is that the side table makes it impossible to place it into a small carry bag. Although it is foldable and has carry handles, it takes a lot of space when packed. Overview: A camping chair that gives comfort with its padded back, arms and footrest. 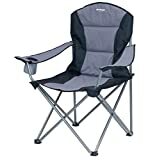 The Portal Outdoor Folding Portable Camping Armchair is provides comfort with its padded back and arms. While this padding doesn’t allow much for breathability, it is UV protected to ensure that sunlight doesn’t damage the fabric of the chair. This is supported by coated steel frames that do not rust easily, are durable, and support up to 120kg. Furthermore, it reclines into three positions from sitting upright to comfortably reclined. The footrest is also padded and when you don’t need it, you can unclip it from the seat pad so that it lies flat on the ground or unscrew it at the feet completely. For storage and transportation, there’s a storage bag that has carry straps. Some users, however, complained that it is a little hard to get the chair back in the storage bag due to its size. Another downside to this chair is its weight. It weighs 5 kg which is much heavier than most camping chairs and this could become a burden when walking from your car or if you chose to backpack. Overview: A water and stain resistant chair that has an adjustable canopy for protection against the sun. The QuikShade Adjustable Canopy Folding Camp Chair provides protection from up to 20 angles of the sun with its adjustable canopy; this canopy can be raised, lowered or tilted, but you cannot completely take it out. It’s also quick to set up, fold and store in its provided storage bag that has a shoulder strap for lifting. While you would have no troubles fitting the compact packed size in an average sized camping bag, it’s 4.4 kg weight may be an issue, especially if you have other weighty items. The frames of the chair are made of coated steel and the seat and canopy are made with quality and strong 600D polyester fabric making it water and stain resistant. This can support an adult of up to 102 kg. It also has two mesh cup holders on both sides and one accessory bag. Overview: A lightweight tripod stool that is sturdy and waterproof. The GEERTOP Large Folding Tripod Stool Slacker Chair is a portable and sturdy stool. It is 900 grams and can be set up or collapsed within seconds. Furthermore, it has a shoulder strap for carrying. This tripod stool is made of reinforced powder-coated steel frames that have an extra centre support system. The three legs are also made with this material making them sturdy. This can carry a weight of up to 100 kg. In addition, the fabric is made of waterproof and durable 600D oxford fabric. The stool is wider than most tripod stool with a width of 14 x 14 x 16 inches. It also has a mesh pocket by the side where you can place your phone, keys, and other accessories as you relax. The downside to this chair is that it is quite low. Secondly, it cannot be used on a muddy terrain; if used, it will sink in and you may tip over. The Kelly low loveseat is a super-comfortable chair for two people. The two seats are wide with a total width of about 110 cm. Furthermore, it is well padded for comfort and is made of the waterproof 600D polyester fabric. The armrests are padded and at an adjustable height which can either slide up or down. There’s also a plastic buckle to hold the armrest in place. The back is also padded but the gripe about this is that it is not breathable. This chair is held stable with thick and durable steel frames that can support a combined weight of 225 kg. It’s also low to the ground like most camping chairs and this may pose an issue for tall people. At 4.7kg, it’s quite lightweight compared to two standard camping chairs, however, this is heavy to move about. The carry bag makes it better; it has wide, padded and adjustable shoulder straps, it also has two easy-grab handles on either end if two people were to lift it. It is also made of the same waterproof and durable material of the chair. Another advantage this chair has over most is that it is easy to set up. This is done by just grabbing both sides and pulling them apart without much effort. Putting it back in the bag is also not hard despite its size. Furthermore, there are two insulated beverage holders with mesh bottoms at both sides of the chair They both have built-in dividers to provide space for other objects like your snack, sunscreen or mobile phone. The major gripe about this chair is its price – over £100. Overview: A sturdy waterproof camping chair that supports up to 180kg weight. Supports up to 180 kg weight. The Vango Kraken 2 oversized chair is ideal for a person that’s heavyweight or a lightweight person looking for extra space. The seat and backrest are padded for comfort and are waterproof and soft to touch due to its 600D tightly weaved polyester fabric. The steel frames are 19mm thick and are texturised for a better finish. It securely locks into place with the locking frames that are also compact folding. This holds up to 180kg weight. It has a low centre of gravity which also adds to strength and durability to the chair. For storage, there’s a handy carry bag. The downside to this chair is its lack of cupholders and the hard steel arms that are not padded. Overview: A waterproof and safe camping chair for children above two years old. The Quest Children’s “Monkey” Camping Folding Chair is great for children between 2-6 years old. It features an animal ‘monkey’ design and has a colour coded carry bag when it’s not in use. The seat and backrest are made of 600D polyethylene-coated polyester fabric. This makes it soft, waterproof, and easy to clean. The 13mm steel frames are strong enough to support a child of up to 45 kg. There’s also the safety lock that keeps the chair open or closed when you click it in place. Furthermore, there’s an integrated cup holder. We haven’t noticed any downside to this chair. Overview: A very comfortable chair which has six reclining positions. The Vango Hampton DLX chair offers comfort with six seating positions – from sitting upright to very relaxed. It’s frames while adjustable are also strong and reliable. They also have a texturised premium finish for a sleek look. The seat and backrest are made of 600D DuoWeave polyester fabric. This makes it extremely resilient and soft to touch. They are also padded for a cushiony feel. Furthermore, the backrest is adjustable and can be tuned into a headrest or folded down for better lower back support. This supports up to 140 kg weight. For storage, it folds flats and can be lifted with the frames. Unfortunately, there is no storage bag, added to it’s heavyweight, it is hard to backpack with it. This DITU Legless Outdoor Chair is designed for comfort with its padded seat, back and armrest. The back doesn’t need to rest on a tree because it has its own back support. Furthermore, it can be reclined into six positions. The armrest can also be inverted. This chair is rainproof. The arms also have steel frames for better support. All these make the chair durable. For storage, it can be folded down and carried like a rucksack with two shoulder straps that are positioned behind the chair. Although it weighs only 3.4 kg, carrying it may be a little tasky when placed with your other camping gear because it cannot fit into any bag.